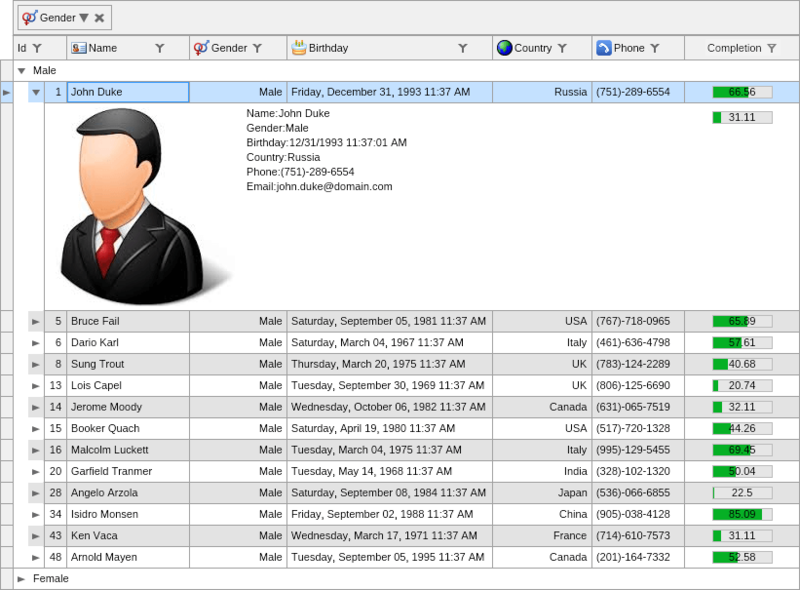 NOV Grid for .NET is a high performance Data Grid component for displaying and editing tabular data within your Windows (WinForms and WPF), Mac OS X (MonoMac and Xamarin.Mac) and Silverlight applications. Currently NOV Grid for .NET includes two grid widgets - Table Grid View and Tree Grid View (ListTreeView) that are built over the same grid core. NOV Grid for .NET provides support for data-binding to a diverse set of data sources. The Grid displays data from a data source assigned to it's DataSource property. A data source is an attribute that aggregates a Data Table. 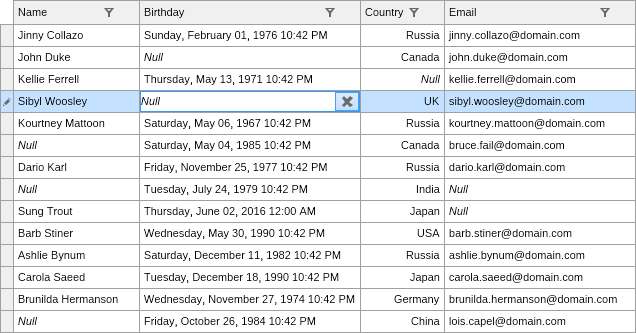 Data Tables help you define data in-memory, or bind to different collections of objects. 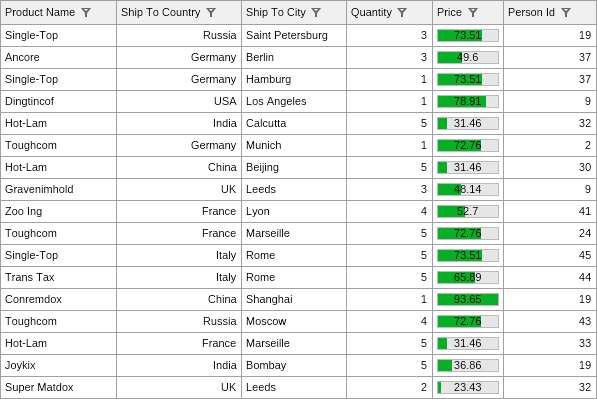 You can work with all types of data tables in a consistent and intuitive manner. 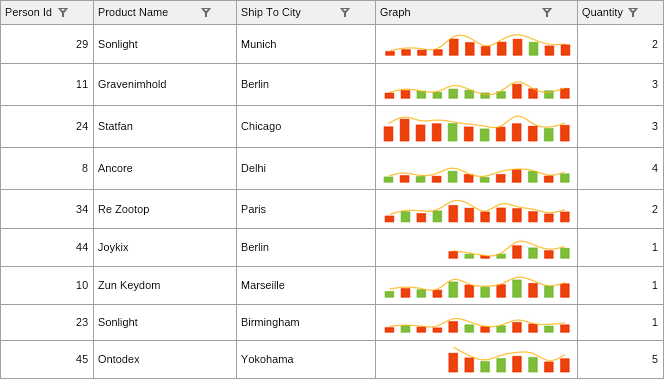 The Data Table exposes various operations that help you add/remove fields and rows, get or set cell values as well as perform different queries. With NOV Grid for .NET you can load 1M+ records (million records) without compromising performance. The Grid allows end-users to perform Smooth Scrolling, Grouping, Sorting and Filtering on hundreds of thousands of records instantly, without lags or delays. 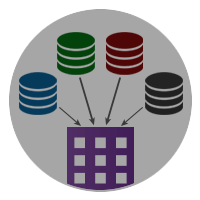 The NOV Grid for .NET data processing capabilities allow you to easily perform Filtering, Grouping, Sorting or Self-Referencing operations on your data. Both the Table Grid and Tree Grid are performing the Filtering and Sorting processes, however the order of the data processing algorithm is different for each type of grid. Following is an overview of the data processing algorithm for each type of grid. 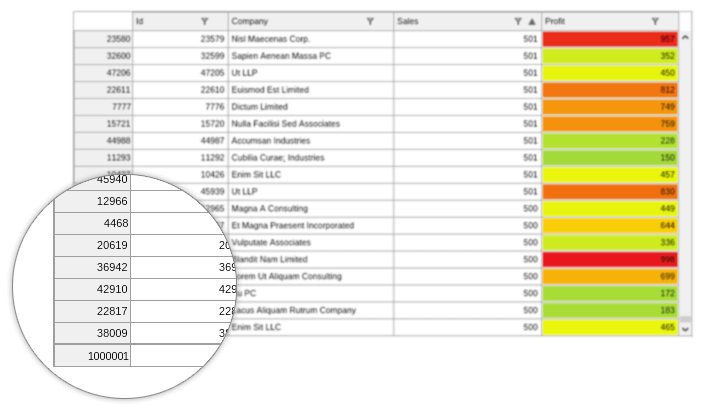 Filtering is the process of passing only certain records from the data source to be displayed by the grid. 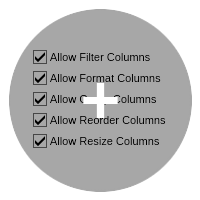 NOV Grid allows you to create filter rules that work on column and field provided row values. This makes it possible to create filter rules that work on calculated columns (i.e. columns that do not have an associated field in the data source) as well as create filter rules that work on data source fields, regardless of whether they are represented by columns in the grid. Sorting is the process of sorting the rows that reside on the same hierarchical level. The grid support multiple sorting rules that define a certain sorting order of the rows that reside at the same level in the grid grouping or self-referencing level. 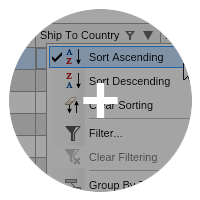 Clicking on the Column Headers or Sorting Buttons - when the user clicks on the column headers or the sorting buttons, this will toggle the sorting direction in which that specific column is sorted. 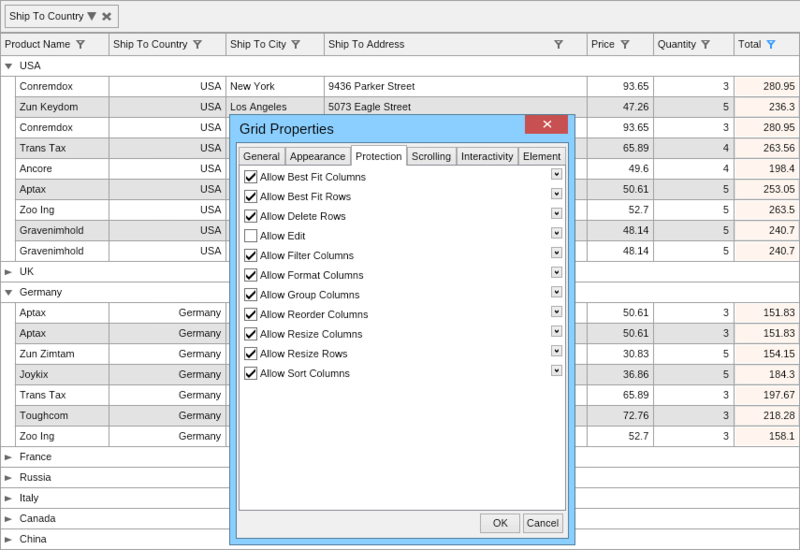 Additionally when the user holds down the Ctrl key, it is possible to perform sorting on multiple grid columns. 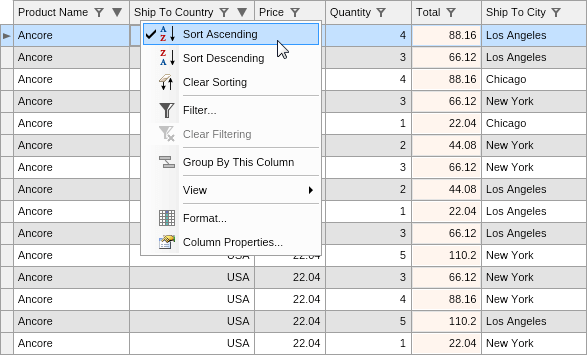 Selecting the Sort Ascending or Sort Descending command from the Column Context Menu - the user can sort by a specific column by selecting the respective commands in the column context menu. The purpose of the Table Grid Grouping is to create a hierarchical organization of the grid rows, such that the rows that reside in each group share some common grouping defined common value. The Table Grid supports multi-level grouping. Because each grouping rule can produce multiple groups and because there are multiple grouping rules, this creates a hierarchically grouped grid. There is a sorting direction associated with each grouping rule. Self-referencing is only applicable to the Tree Grid. 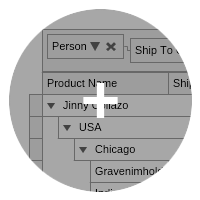 Self-referencing produces a tree-like structure from a tabular data source. This is achieved by specifying two fields of the data source - one that identifies each record uniquely and another that specifies the parent record of the record. 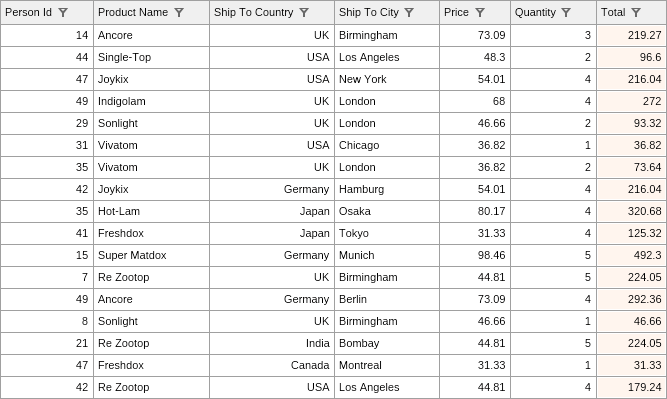 Master - Details is a feature of the Table Grid that allows you to display additional information (details) for each record data row. Master - Details allows you to display other tables data that is related to the master table rows - NTableGridDetail and NTreeGridDetail are master-details that can display a Table Grid or Tree Grid showing information from a slave data source. Formula Calculated Column - this is a calculated column that is defined as a formula. 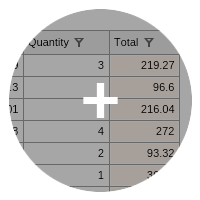 The value that this column assigns to each row is the result of a formula evaluation, where you can use other column values. Custom Calculated Column - this is a calculated column that calls a user handled delegate to obtain a row value on-demand. 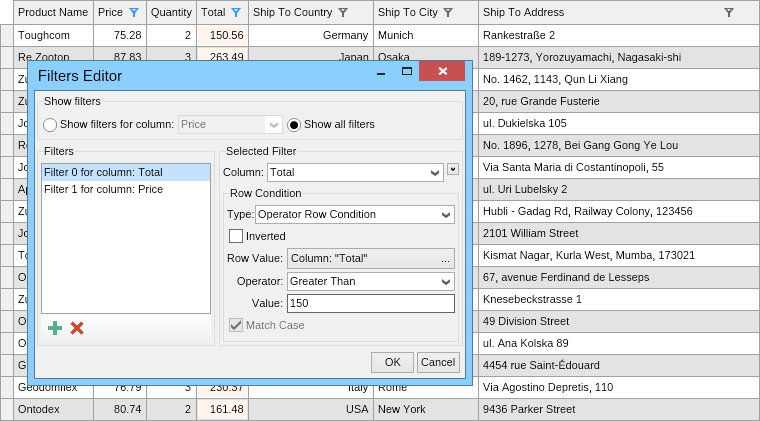 Filtering, Grouping and Sorting can be performed on the calculated columns. 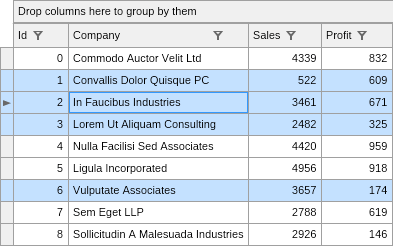 Column Conditional Formatting helps you format certain data cell views, according to specific rules. NOV Grid for .NET provides strong support for authoring complex cell conditions. Besides static fill rules, NOV Grid for .NET also supports gradient background and text fill declarations, that can be defined as a two color or three color gradient. 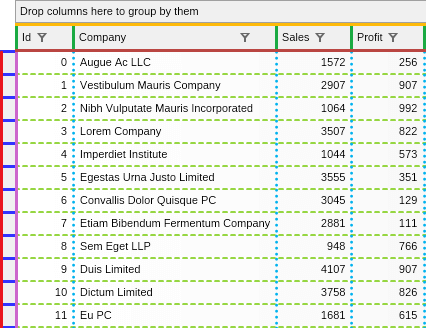 The NOV Grid Column Format allows the modification of the visualization of the data cell value. Default Column Formats - these are the standard column formats that the grid by default uses, for specific row values types. 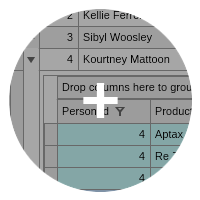 Extended Column Formats - these are column formats that the grid does not use by default, but you can manually assign to certain columns. 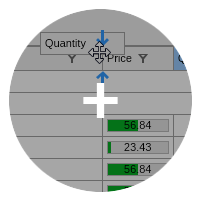 NOV Grid also provides support for Custom Column Formatting - this allows you to use any NOV widget to represent the row values e.g. 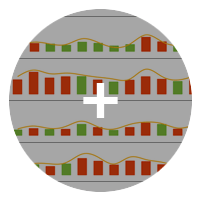 Charts, Gauges, Barcodes, or other widgets. 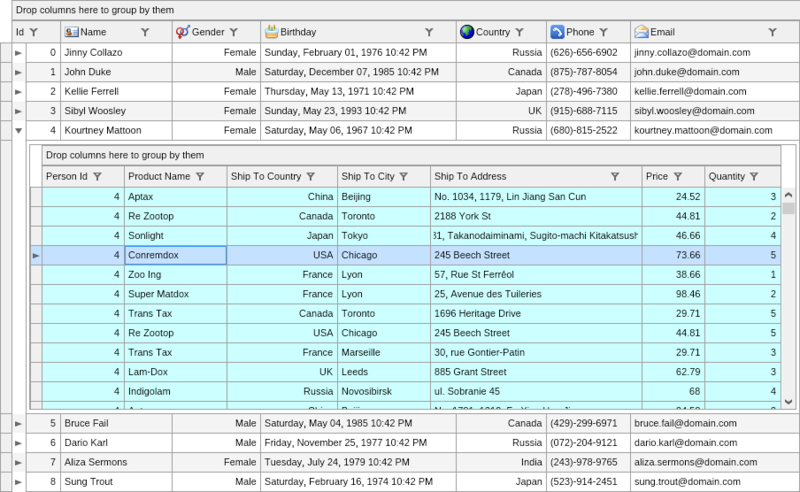 Additionally the user can also resize the columns or double-click the column separators to "best fit" the columns. 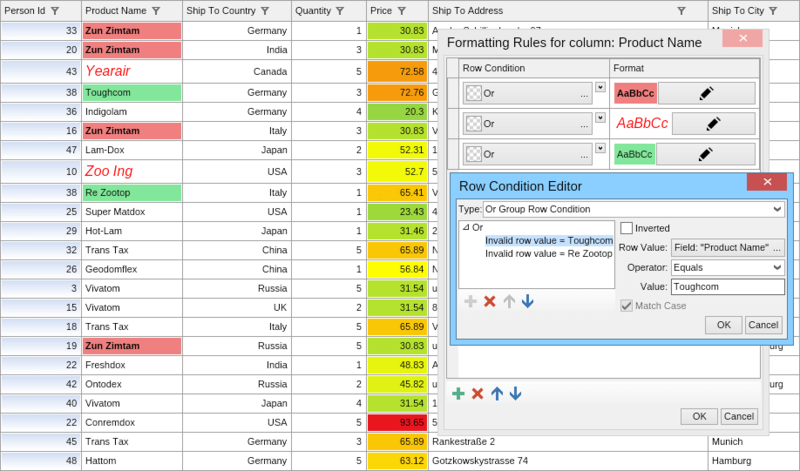 Reordering Grid columns – allows the user to change the order of the columns by dragging them. NOV Grid for .NET provides support for Frozen Columns and Frozen Rows. 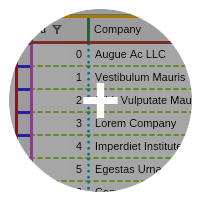 Frozen Columns can be frozen to the left or right side of the grid window area. 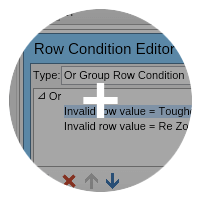 Frozen Rows appear pinned to the column headers and they are controlled by the FrozenRows grid property. 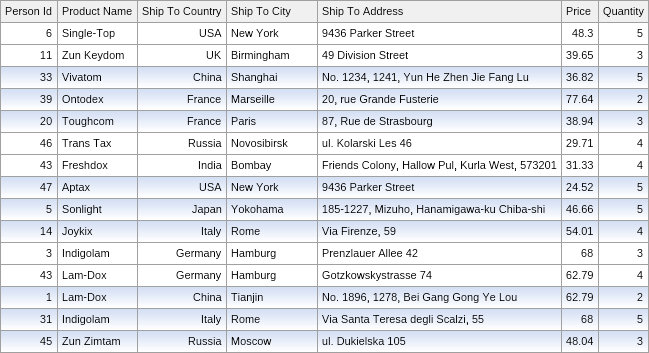 It specifies the count of rows from the top of the grid, that are non-scrollable. Grid protection refer to the set of properties that can help you restrict the user to perform certain actions with the grid in general. For operations that apply to columns, there is also a respective Column Protection property that can restrict the same operation for a specific column only. NOV Grid for .NET provides support for Null Values. 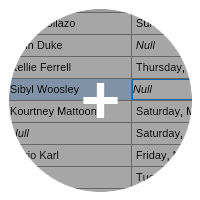 The Grid also supports editing of null values. The Grid selection is organized to work around grid rows and to maintain the notion of a Current Row and Current Cell. 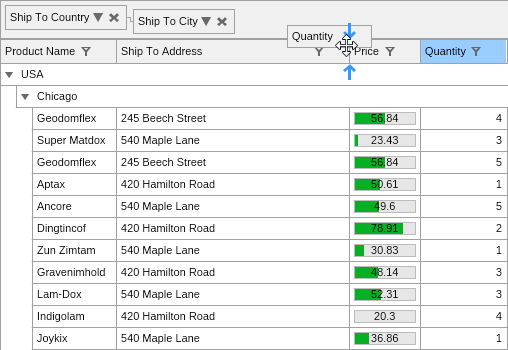 The Grid selection is also responsible for performing a variety of navigation commands that can alter the current cell, select/deselect rows and also change the current cell. The selection also exposes properties that control the events that trigger the current cell editing. The Grid alternating rows are useful when you need to display grids with many columns, since the user can easily follow the values that belong to the same row. Thus alternating rows increase the readability of the grid. NOV Grid for .NET provides full control over the alternating rows appearance, interval and length. NOV Grid for .NET features several types of gridlines that are displayed by the Grid cells, Columns and Row Headers. NOV Grid provides full control over the appearance of the gridlines stroke. NOV Grid for .NET provides full localization support and right-to-left support. The NOV Framework Localization support allows you to translate the entire user interface (UI) of your applications. The architecture of the NOV Framework allows you to host any NOV Widget into other NOV Widget. This allows you to use NOV widgets to represent the Grid row values, for example Charts, Gauges, Barcodes, or other widgets.